On June 25, 2018 at 10:12 PM, Cheshire firefighters responded to the area of 21 Diana Court for an outside fire. 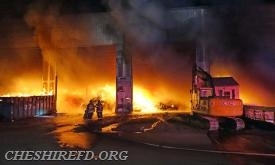 Upon arrival in the area, Cheshire Engine 6 found a large fire at the adjacent transfer station. Firefighters immediately began to extinguish all visible areas of fires using large master stream devices. The fire involved a large storage and sorting facility for trash. 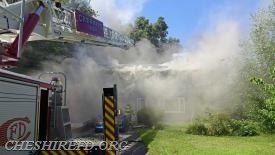 First-arriving personnel found a substantial amount of smoke emanating from the residence. Your feedback is important to us! Please feel free to sign our guestbook. Be sure to include your e-mail address. 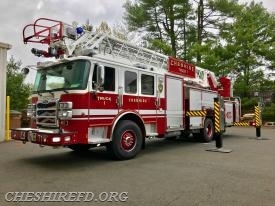 All images and content appearing on this web site are the property of The Cheshire Fire Department, unless otherwise stated, and may not be used without the expressed written consent of the Cheshire Fire Department. 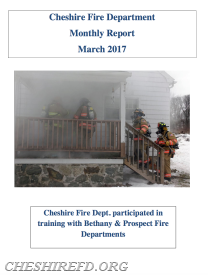 If you have any questions or wish to obtain a copy of a photo or any content from this site, inquiry requests may be submitted to media@cheshirefd.org .